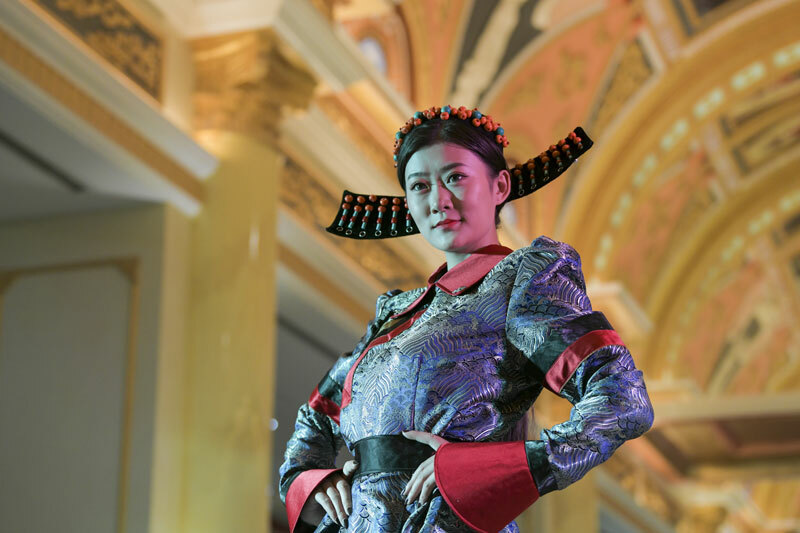 The finals of the First Mongolian Garment Designing Competition commenced in Hohhot, Inner Mongolia autonomous region on Aug 5, highlighting the mix of traditional ethnic culture and fashionable elements on clothing. As one of the activities of the 15th China Inner Mongolia Grassland Culture Festival, the contest was launched on June 1 and 1,417 sets of clothing were submitted from 234 participants. A total of 100 dress designers with 698 clothes entered the finals. The event was sponsored by Publicity Department of Inner Mongolia Party Committee, Tourism Development Commission of Inner Mongolia, Inner Mongolia Culture Bureau, Inner Mongolia Daily, and Inner Mongolia Ethnic Costume Association. The organizers invited professors, experts, artists and entrepreneurs specializing in fine arts, folk culture and dress designing as the judges. The awards ceremony plans to be held at Inner Mongolia Sports Stadium in Hohhot on Aug 13. Besides, extraordinarily designed clothing will be on display at the 3rd Inner Mongolia Culture Industry Expo from Aug 10 to 14. A forum focusing on the development of Mongolian ethnic clothing will be also held on Aug 11.